Still trying to recover from the worst-ever poll debacle suffered in the Lok Sabha polls, the Congress today held a brainstorming marathon meeting with the Block Congress Committee (BCC) presidents from all Assembly segments to look into the reasons for the defeat. The district administration held a meeting with representatives of various associations and unions related with the tourism industry at Manali, about 40 km from here. 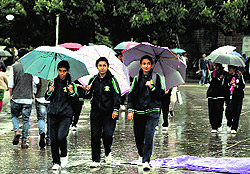 The government is in no mood to relax the conditions for admissions to engineering colleges in the state. This was stated by Technical Education, Transport and Food and Civil Supplies Minister GS Bali while addressing a press conference here today. The Himachal Pradesh High Court has quashed the counselling for admissions to postgraduate MD/MS courses held by Indira Gandhi Medical College and Dr Rajindra Prasad Medical College, Tanda, on March 28 this year. A large number of unemployed youths who have applied for written examinations for the posts of clerk in the Himachal Pradesh Service Selection Board (HPSSB) and the Indian Postal Department are in a dilemma as both examinations have been scheduled on the same day on June 8. Residents of Jaind village of Sulaha constituency yesterday staged a dharna in front of the office of Executive Engineer, Irrigation and Public Health (IPH), at Thural to protest the non-availability of drinking water in the area. The work on the channellisation of Swan river’s three tributaries, estimated at Rs 39.63 crore, was formally launched by Industry Minister Mukesh Agnihotri at Badheda, Pandoga and Khad villages of the district. The 10 km embankment work on both sides of the Pandoga tributary will be constructed at a cost of Rs 14.47 crore, 7 km embankment along Badheda tributary will be constructed at a cost of Rs 13.2 crore, while a sum of Rs 11.96 crore will be spent on the 10 km embankment of Khad tributary. Health and Family Welfare Minister Kaul Singh Thakur today flagged of a rally organised by students on World No Tobacco Day today at the zonal hospital, Mandi. The district Excise and Taxation Department has topped the state in revenue collection for the second consecutive year. During 2013-14, ~341.71 crore was collected as tax, which was 27.49 per cent more than the revenue generated in 2012-13. Wary of the attitude of Narendra Modi government at the Centre towards the Rs 1,307 crore Pabbar gravity water supply project, Himachal Irrigation and Public Health Minister Vidya Stokes today defended the project and counted its merits over an alternate project. The Municipal Council (MC) has decided to install CCTVs to check dumping of garbage and encroachment on government land in the town. Perturbed over frequent clash between student organisations having affiliation to major political parties, Himachal Pradesh University Vice-Chancellor ADN Bajpai has decided to approach state presidents of various parties and apolitical student outfits to tackle excessive politicisation of teachers and student community. Power generation has failed to pick up this year, as power projects with HP State Electricity Board Ltd (HPSEBL), including 1500 mW Nathpa Jhakri and 1,000 mW Karcham Wangtoo, have not attained their peak generation this summer so far. Former Director General of Police (DGP) ID Bhandari today accused the state government of haunting and targeting police officers and said the Vigilance and Anti-Corruption Bureau seemed to be working overtime to prove the charges contained in the Congress chargesheet and target people. A national-level conference on “Innovation in engineering, pharmaceutical, legal and management sciences” was organised at Bahra University, Waknaghat, today. Yoga guru Swami Ramdev’s associates Acharya Balkrishan and Lalit Mohan, MD, Patanjali Yogpeeth Trust’s Kehlog-based land, were today granted bail after the duo joined investigations in a case of forgery, cheating and criminal conspiracy. The Karsog police have arrested two Nepali labourers on the charge of murder. A devotee from Punjab was killed while seven others seriously injured when the tempo they were travelling in overturned near Harsour this morning. A karate trainer was killed when a tipper hit his motorcycle near Badah here yesterday. Himachal Pradesh Congress Committee president Sukhwinder Singh Sukhu chaired a meeting of all 68 block Congress committee (BCC) chiefs here today. The main objective for holding the meeting was to get the feedback from workers for the defeat in the Lok Sabha elections and take corrective measure to ensure that the party emerges stronger from the setback. Though most of the BCC chiefs admitted that there was a powerful Modi wave, majority of them felt that had there been better coordination between the party and the government, the results would not have been so adverse, said an office-bearer. He said it was after getting the report from block observers all over the state that corrective measures would be initiated to strengthen the organisation. As per the report sent by the BCC and District Congress Committee (DCC) chiefs, many ministers and legislators could not ensure a lead at their home-polling booth for the Congress candidates in the Lok Sabha polls. Majority of chairmen and vice-chairmen of boards and corporations had fared badly in their areas. Party leaders have attributed the poll drubbing on lack of coordination between the state government and the party organisation. Another major grouse aired by office-bearers was that with the party workers not having a say in the government or being given a prominent position, there was a lot of resentment among party cadres. “Leaders who have no experience of electoral politics and do not have much of public interaction have been given prominent positions which too led to the party’s debacle,” said another BCC chief. Sukhu in his address to the BCC chiefs said victory and defeat were two sides of electoral politics. “This is a temporary phase, but we must learn from the defeat and remove all shortcomings which could have been responsible for the setback,” he said. He said he was taking feedback from all the BCC and DCC chiefs to be able to find out the exact reasons for defeat. The enforcement of the National Green Tribunal (NGT) orders had erupted a series of protests by localites at Manali in the past couple of days. While the number of vehicles to go beyond the barrier at Gulaba was raised to 4,000 per day, the regulation of commercial activities near the snow-point was a major cause of resentment among residents. The fear of strict enforcement of orders of the NGT in totality was another issue of concern for which residents and various associations had voiced concerns and their view was pleaded before the NGT by the Kullu administration and the state government, scheduled to be heard on June 25. Manali MLA Govind Singh Thakur had supported the protests and was not present at the meeting. The MLA said the dilly-dallying attitude adopted by the district and state administration to represent the public view before the NGT had led to this situation. He lamented that bureaucrats were not aware of the problems and public representatives were not approached before presenting one-sided opinions to the NGT. He said while large costs incur to appoint lawyers to plead at the state or national level, it was duty of the state government to protect the rights and interests of the masses. Deputy Commissioner (DC), Kullu, Rakesh Kanwar said representatives were apprised of NGT orders and they were informed that any relaxation or clarification would have to be sought from the NGT. He said the state government had already filed an affidavit before the NGT, voicing the concern of the masses. He said it was resolved that the district administration would submit a fresh application to the NGT raising apprehensions of the localites. Meanwhile, he said orders of the NGT would be enforced and every effort be done to regulate activities permitted by the NGT in the snow zone. Puran Chand, president, Him Aanchal Taxi Union, Manali, said they would put up facts only in front of the DC and not participate in joint meetings on the issue. While the NGT has suggested various measures to protect the fragile environment of the Rohtang Pass region, with livelihoods of localities at stake, it would be a hazardous path ahead for the district administration to enforce orders of the NGT. He said the government was firm on implementing the appearance in AIEEE as a minimum condition for admissions to the engineering colleges of the state. “We have put our stance before the Himachal Pradesh High Court also over the issue and conditions will not be relaxed this year,” Bali said. Last year, the government had allowed the engineering colleges to admit students as per the norms fixed by the All-India Council of Technical Education (AICTE). Earlier, the state government had kept appearance in AIEEE or minimum 65 per cent marks in 10+2 as the condition for admissions in engineering colleges. However, the engineering colleges of the state lobbied against the government’s decision. They maintained that there was no such condition for admissions in engineering colleges in Punjab or other adjoining states. They maintained that even the students from Himachal were opting for admissions in adjoining states due to the tough conditions laid by the state government. If students with less than 60 per cent marks wanted to do engineering course they would take admission in Punjab in case denied admission in Himachal, the engineering colleges of Himachal maintained. Last year, the government had given one-time relaxation to the engineering colleges to admit students as per the AICTE conditions that about 45 per cent marks in 10+2 for the general category students and about 40 per cent for SC the students. However this year, the engineering colleges have taken a legal recourse against the government decision. Bali also clarified that the state government had concentrated just on the HPCA and not on other charges against the previous BJP government. He said he I had just said that other charges levelled in the Congress chargesheet against the previous BJP government should also be probed. While quashing the counselling, a Division Bench comprising Justice VK Sharma and Justice Dharam Chand Chaudhary further directed both the medical colleges to hold a fresh counselling strictly based on the state merit list. The High Court passed the judgement on a petition challenging the action of the colleges vide which they had prescribed 66.6 per cent of the state quota seats to be filled up by in-service medical officers. According to the petitioners, these seats are required to be filled strictly in accordance with the merit determined on the basis of the state rank of a particular candidate irrespective of the fact whether he is a regular medical officer or a contractual (including Rogi Kalyan Samiti (RKS) appointees) and the candidates are required to be called for counselling strictly in order of merit so as to enable more meritorious candidates to opt for a specialty of their choice. Earlier, Himachal Pradesh University (HPU) had scheduled the BEd entrance test on the same date. Following the clash of examinations, HPU had yesterday re-scheduled its test on June 7. Anil Kumar, Suresh, Ankit, Deepak, Rohini, Rashmi and Kiran who have applied for both the tests rued the clash. They alleged that a large number of applicants seeking clerical jobs would be deprived of an opportunity as they could appear only in one examination. There is a demand to reschedule dates so that youths could appear in both examinations. There is an acute shortage of drinking water in a dozen villages of Sulaha Assembly segment. Most of the villages have not received water for the past four days. Villagers alleged that the IPH Department was well conversant with the situation but no efforts were being made to restore the supply. In many villages, residents have been forced to take contaminated water from local stream which can lead to epidemics. However, the IPH department is unconcerned with the situation, they rued. Residents said they had time and again requested the authorities and a written complaint was also submitted to the local Junior Engineer but no efforts were made to streamline the supply of water. They alleged that the lack of proper management and failure of local officers had led to serious drinking water crises in the areas. Meanwhile, Executive Engineer, Thural division, met the agitated residents and assured them that drinking supply to the villages would be restored in the next two days. He said with the onset of summers, the water level had gone down, leading to low pressure in the supply line. Besides, in summers the demand of water also went up and was another reason for shortage of water, he added. Agnihotri said about 245 hectare land would be saved from the fury of annual floods after the embankment work was complete in these three panchayats. He said the project was part of the Rs 922 crore project to create stone-pitched flood protection embankments on all 73 tributaries of the Swan river, which flows in Una district. The minister said once complete, the project, which has received 90 per cent funding from the Union government, would be the biggest flood-protection work in any district of the country, where almost all water channels of a river would be protected from floods. He said the main river has already been channelled. Superintending engineer of the Flood Protection Circle, NM Saini, said the entire project had to be completed in four years time. He said in the first phase, works amounting to Rs 150 crore had been allocated for flood protection in various tributaries. Addressing a gathering on this occasion, Thakur said the state government was making every effort to reduce tobacco consumption in all forms. He said the state had already been declared smoking-free and smoking at pubic places was completely prohibited in the state. The minister said there was need to spread awareness among youths about the ill-effects of smoking. Thakur said the WHO had suggested levying extra tax on tobacco products to check its usage and appealed to the youths to not take up smoking. Kangra: World No Tobacco Day was observed at Minerva Public Senior Secondary School, Alampur, (Thakudawara) today. The students were made aware about the consequences of the consumption of drugs and use of tobacco. Hem Lata, principal of the school, said the students and teachers took out a rally to create awareness against consumption of tobacco and drugs, particularly among the youth. Hem Lata and other teachers of the schools addressed the students and shared their views about the menace of tobacco and drugs. Nuprur: A patient provider meeting was organised in the district by the State Health and Family Welfare Department, under National TB Control Programme. Smokers were counselled to quit the habit. A meeting with Ayurvedic Medical Officers and patients at Kherian near Nurpur was also organised. Dr RK Sood, Kangra district TB officer, today said in the awareness meeting, the department sensitised people that smoking increased the risk of Tuberculosis (TB) substantially and death toll due to TB was upto three times more in smokers. Dr BM Gupta, Chief Medical Officer, Kangra, said tobacco cessation services were available at de-addiction clinic at Zonal Hospital, Dharamsala. Ujjwal Singh Rana, Una Assistant Excise and Taxation Commissioner , said the district secured the first slot in revenue collection and also topped in annual revenue growth rate. He said the district had also topped the state in revenue collection in 2010-11. “The Pabbar gravity project is not only a permanent solution to water-shortage problem in Shimla for the next 30 years, but the pipeline can also be extended to Solan in future,” she told The Tribune. She said the alternate project envisaging lifting of Sutlej water from Kol Dam had several disadvantages. She said she would continue to bat for the Pabbar project. She said the lake from where the water is proposed to lift is filled with silt, which could damage heavy machinery. She said the cost of power for pumping was estimated at Rs 100 crore, per annum which was prohibitive. “I believe Pabbar project is a viable project as compared to the Sutlej lift water supply project, as it will become more cost heavy with the passage of time,” she said. “Don’t blame me if things go wrong in the future as lifting water from Kol Dam will put additional expenditure of Rs 100 crore per annum on the account of high cost of power, which will have to be borne by the department,” she argued. As far as the forestland is concerned, the route of the channel can be changed with tilts and this exercise has already been undertaken and only the World Bank funding is awaited. However, experts said there was a huge gap between the capital cost (nearly Rs 910 crore) and calculating the bank interest and operation cost during the next 30 years, the Kol Dam project is quite cheaper. The cameras will be installed at different locations on rotational basis. The initiative has been taken to put a check on littering and dumping of garbage in streets, markets, roadsides, river banks and other places. The MC has started door-to-door collection of garbage, besides placing dumpers at different places. An MC official said garbage dumping was a big problem as a large number of citizens were throwing garbage in the open and even in the Beas despite MC launching several campaigns. Four cameras will be installed at Mahamritunjaya temple, Suhada colony, and near Sanjeevan Hospital in the town tomorrow. Later, the cameras would be shifted to other places. “The CCTV cameras will keep a record of garbage dumping, littering and encroachment on government land,” he added. Interacting with mediapersons here today, Bajpai, who recently got a six-month extension after his term ended on May 24, said he was perturbed over student violence and wanted to take steps to put an end to this trend. “I will even approach the state government so that some concrete steps can be taken to curb violence on campus which vitiates the academic atmosphere and cause stress on those who want to focus on studies,” he said. He said political indulgence by university teachers too was not a healthy trend. “As per rules, teachers can contest Assembly, parliamentary or other elections after seeking leave, but they cannot incite students,” he said. He said, so far, he had not found any teacher directly involved in inciting students, but if this happened he would not hesitate in taking action. “I have been given six-month time and I will give my successor a better university, which is not marred by bloody clashes between students from various outfits,” he said. He said he would also prepare a list of do’s and don’ts for employees in a time-bound manner. He admitted that the over indulgence of university students in various organisations having political affiliation was often the cause for bloody clash on the campus and in hostels. “I will soon seek cooperation of party chiefs of various organisations such as the Congress, BJP and the CPM to convince their activists not to indulge in violence and focus more on academics,” he said. He said there were several instances, where very bright and meritorious students had ruined their promising careers by getting involved in such clashes as there are several police cases against them. Bajpai said a majority of students too seemed to be fed up with this charged atmosphere, where there were clashes on the campus every now and then. “I will urge students thorough apolitical association such as tribal students’ body, district wise student associations, not to get involved in political activities and resultant controversies,” he said. The average production of power is hovering between 65 per cent and 41 per cent of the installed capacity. The discharge in the snow-fed Beas, Satluj, Ravi and other rivers has not increased significantly so far due to slow melting of snow. Power generation attains its peak between mid-May and May-end and this time it may extend till mid-June, an engineers said. Also, there are few takers for power traded through the energy exchange, as the rate of electricity today dropped from Rs 4.17 per unit to Rs 3.29 per unit. The rate can drop further when all power projects would attain peak generation in June, an official said. The state is getting a daily demand of about 250 lakh units, as against generation of about 325 lakh units, which varies from day-to-day depending on generation in power houses. The HPSEBL alone produces an average 76 lakh units of electricity these days, revealed sources. On the other hand, Directorate of Energy gets an average 95 lakh units of electricity every day these days from Nathpa Jhakri, Karcham Wangtoo, NHPC and other projects as these produce about 60-65 per cent power as against their capacity. The demand too has not picked up this summer. The neighbouring states of UP, Punjab, Rajasthan, Delhi and Haryana and other power-deficient southern states such as Tamil Nadu, Karnataka and Andhra Pradesh resort to periodic power cuts and do not buy power traded in energy exchanges, an engineer said. The demand has not picked up so far despite the fact that all power grids have been connected through the central grid system put in place last year. MD, HPSEBL, BS Negi said the generation in most power projects has not peaked so far due to slow melting of snow. “The peak generation is expected in the first two weeks of June and we are selling power through counter-banking with Punjab, Haryana and other states,” he added. Addressing a press conference here today, Bhandari lamented that Himachal which was known as a pioneer state and police reforms had given a complete go-by to the Police Establishment Board and Police Establishment State. He also lashed out at the state government for misusing Section 312 of the CrPC to benefit influential person. He questioned the decision of the government to allow withdrawal of the case against former Congress minister Singhi Ram and former chairman of the Board of School Education BR Rahi in the fake certificate case. “The powers under Section 321 of the CrPC could be used by the government only in cases where public interest was involved and in this particular case, I fail to see what public interest is involved,” he said. He also targeted the Vigilance Bureau for failing to trap people and check corruption among government employees. He said it appears that the only task for the Vigilance Bureau was proving allegations contained in the chargesheet. “I am of the firm opinion that this culture of both the Congress and the BJP coming out with chargesheet in Himachal is very unhealthy,” he said. Experts aired their views on innovative trends in mathematical, physical and chemical, material sciences, engineering, management sciences, communication and pharmaceutical sciences. Prof IC Syal, former professor and head, Punjab Engineering College (PEC), Chandigarh, while delivering his keynote address spoke about innovations in various fields in the present times. The case was registered against the trust on February 13. The duo had applied for the anticipatory bail in a local court where they were directed to join investigations within 10 days on March 24 and appear before the investigating officer (IO). Additional Superintendent of Police Padam Chand, the IO, said the duo had furnished surety of Rs 20,000 each in compliance with the court orders. He said they were interrogated in the case involving lease of 28 acres of land that had been granted to the trust in 2010 at Kehlog village near Sadhupul in Kandaghat subdivision of the district. The Solan police had registered a case of forgery, cheating and criminal conspiracy against officials of the Revenue Department and representatives of the Patanjali Yogpeeth Trust on February 13. The case was registered after an inquiry found that the trust was earlier granted in-principle approval by the state government to give land on lease at Chaura village in Kandaghat subdivision in 2008. The trust representatives, however, approached the Deputy Commissioner (DC) with a letter stating that the government had accorded in-principle approval for giving land on lease at Kehlog village. Sources said the location had been changed by an overwriting and the letter was undated. The role of revenue officials who had executed the lease was also under the scanner, sources added. The devotees were on their way to Baba Deoth Sidh temple. Bunty, a resident of Ludhiana, was killed while seriously injured four women and three children were admitted to the Government Hospital at Una and others were being treated at the Government Hospital in Badsar. Badsar SDM Sonia Thakur and other officials reached the spot. The speeding tipper rolled over after hitting Nihal Chand, chief trainer at Nihal Karate School. He had provided training to over 12,000 youth of the district. Recently transferred Kullu SP Vinod K Dhawan spotted the victim and rushed him to a hospital. Kullu DSP Sanjay Sharma said a case had been registered and investigations were on.